It is now 2012, and whether or not you believe the hype about this year, I believe that we all notice that there is a quality to the movement of time which is succinctly different. Time is moving faster, not just in our experience, we can actually mathematically prove it. One way is through the Fibonacci sequence, the golden number, which is found throughout nature. 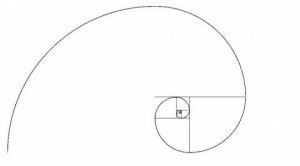 What will happen as we get to the ‘end’ or ‘beginning’ of the spiral? And how will we experience time going to that point? However, we can guess. We can take the science we have, and add it up to the most plausible theories, to come out with a ‘maybe’ scenario. So, on the astronomical level, we see an alignment of the Earth, the sun and the centre of our galaxy, The Milky Way on 21st December of this year. This date could very well be a convergence of time-space or space-time reality into one singlularity, a moment in time when time perhaps just stops? If so, what will that do to our experience of ‘reality’? Certainly interesting concept, time stopping. Everything we live, breathe, say, do, think is dependent on the seeming flow of time from past to present. Our physical laws have never differentiated between past and present, however, so from a scientific point of view, we can not explain why this is so. From a scientific point of view time should just as easily flow the other way. This clearly contradicts our experience. We obviously have a lot of unanswered questions regarding our origin, what we truly are and capable of, and what our purpose on Earth is. The universe being this super complex structure, all based on intelligent design, is a living organism, breathing, pulsating with the heartbeat of the life-force which flows in all living beings, from the smallest to the largest. Maybe this date will bring back our memories, and give us an udnerstanding of where we are from, why we are here, and where we are going? A lot of evidence is showing that this is already the case, with more information being leaked from top secret stamped documents than ever before. The concept of alien lifeforms visiting earth is now not as strange and prone to gather laughter as it did, say, 10 years ago. What a lot of our greatest thinkers imagine is going to happen is a shift in our consciousness. an evolution, not in the sense of growing an extra limb, or losing a tail, but in the a spriritual sense. Our minds are evolving. Scientists have now reached the furthest edge of our universe with their telescopes, and not unlike the way a newspaper picture becomes dots when you zoom in, in the same token our universe seems to ‘grain up’ when zoom closer and closer to the origin of it all. Leading scientists to propose that we actually live in a holographic universe. This is what scientist Dean Radin is also proposing. He has written the book ‘Entangled Minds’ and it is based on his empircal studies of observations regarding our ability to send and receive thoughts, aka telepahty. Seems pretty conclusive that we have this ability, but the ability is obviously stronger and more present in people who are regular meditators. People who meditiate for longer periods of time have learned to hone their concentration skills. Our concentration, or attention, is our strongest tool. Whatever we turn our attention to, will grow. This is the reason why positive thinking is so important, atleast 51% of the time. The Law of Attraction will also only work for you in the direction you desire, if you feel good 51% of the time. As thoughts produce feelings, one can clearly see the importance of learning to monitor our thoughts. 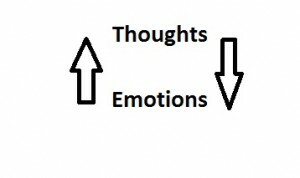 In fact, thoughts and feelings are so closely interralted that one might just call them ‘theelings’. For every thought you think, you produce it’s neuropeptide. These neuropeptides bind to every organ system of your body, so negative thinking produce negative neuropeptides, which then produce negative or depressed heart, lungs liver etc. And for positive thinking it is vice versa. This corresponds with what we observe in the hospitals around the world, that generally speaking, optimists live longer and healthier than pessimists. Now, from this simple diagram it is clearly seen that as you think a thought, and that thought produces a specific emotional state, or vibration if you will, that same vibration will attract to it more of the same thoughts! Which is why when you argue with your better half, you will always remember all the other times they acted as a silly git, once you start fighting. Like attracts like. We have classicaly been taught than in order to change our emotional state, we have to change our thinking. Which is true! And meditation is the most recommended method for achieving this, and since meditation is a great thing, this has not been subject to a lot of contreversy. Meditation puts you in that quiet space that keeps the egois mind quiet, and allows for you to tap into the cosmic consciousness. Now, if you are a human being like me, i am sure you will have noticed that meditation seems simple, but oftentimes can be everything but. Especially if you are stressed, tired, worried about your kids. it doesn’t matter how much the ‘enlightened’ ones say that you must not worry, be happy, smile! Sometimes, we don’t feel like it, and despite trying our darndest, we just can’t get that egoic mind to shut the hell up and we sit with our eyes closed and legs crossed, listening to the never-ending soap opera created by our minds. Also, I have a feeling that so many of our benevolent creatures, going around smiling half smiles because it uses less muscles than when you frown, are a little bit fake. I am not saying they do not have honest intentions, but oftentimes they refuse to acknowledge their own humanity. They say we should all be peaceful and not desire anything, and let go of everything. Well, to a certain extent that is also true. However, desire, anger, passion, jealousy, drama, isn’t that the spice of the world we live in? Does that mean i believe in sin and immorality, no! But pay attention to whose set of rules you are living your life by. What may be immoral to one, may not be immoral to another. One man’s bread, is another man’s poison, the saying goes. So you have to figure out what YOUR values are. What YOU think is ok and not, and live by that. However, this is often hard, because our minds have been so conditioned by parents, school, work and society at large, that when we finally become old enough to dare walk the road less travelled, we lose our way because we are not used to following our inner signs. Then what do we do? We tune into our noisy mind and ask for it’s guidance. And so we end up with a society of violence and disharmony, because the mind is a great servant but a horrible master. Like Einstein so wisely put it ‘In our intuitive mind we have a beautiful gift and in our critical mind a faithful servant. We have created a society that honours the servant and has forgotten the gift’. So it is time to find back to our gift. So what is this gift and how do we access it? Well, dear child ha smany names. The sub-conscious, the intuitive mind, the cosmic mind, our God-presence, stillness, the creative mind. If you ask an artistwhere they get their inspiration from you will find that it is always in a flash, they do not sit down and logically think their painting or poem into being. A lot of inspirations or solutions to problems come in dreams, and it is our ability to decode these dreams that give us the answers. When a mother sees her child under a car and lifts the whole car, she does it wihtout thinking, without the intereference of the critical mind. Had she let the critical mind get online, she would never have been able to undertake such a feat, yet these stories happen everyday. Or stories of people becoming cured from terminal cancer when modern medicine has thrown in the towel and given up all hope. Something happens in the minds of these people, a switch, had medical doctors on the whole been more prone to curiosity about these things, rather than curt dismissal, we might have had a better understanding of that mechanism today than before. However, a lot has been done in this field lately, and through amazing books like “Source Field Investigations” by David Wilcock we are just dumbstruck by the vast amount of psi science that is out there. Observations that so far have not been adressed by the mainstream scientific community, but it is imperative that they do, because we do need a change in our paradigm of thinking in order to fit a new era.